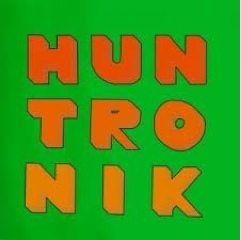 Atlas and the Anchor: Free Friday: Huntronik - "Huntronik"
Brooklyn electro-rock trio Huntronik just released their self-titled debut album as a free download on their Bandcamp page. The promising 9-track affair is filled with plenty of surprises such as taut and hypnotic Krautrock rhythms, swirls of psychedelic synths and an off-kilter pop sense that sounds like Animal Collective in a night club. The EP opens with the thick rumbling bass and spacey synths of “Rabies” and is followed by the energetic standout track, “Everyone Is A Website” and its bouncy and propulsive beat, distorted fuzzed-out guitars and catchy pitch-shifted vocals. “Delivery Man” delivers another standout moment, opening with a crazed rhythm and stuttering guitar riff before launching into a more straightforward rock tune with a honky-tonk piano line.